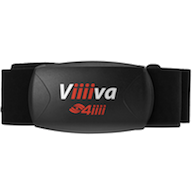 VIIIIVA Bluetooth & ANT+ HR soft strap. - This heart rate strap works with both the Bluetooth and the ANT + frequency. - Works as "bridge" converting ANT+ sensors to BT 4.0 so they can be received by devices supporting the Bluetooth 4.0 standard (smartphones or some Polar and Suunto devices, etc.). - Activity Logging for saving data directly on Viiiiva without taking your phone or device (65hrs of memory). - New heart rate algorithm for highly responsive heart rate monitoring (ten times more accurate than most other sport heart rate monitor options). - Advanced beat-to-beat measurement for better tracking of Heart Rate Variability (HRV). - Pairing to ANT+ enabled Fitness Equipment fore real-time data and activity logging (Look for the “LINK HERE” logo). - Tap to Pair between Viiiiva and your smartphone.